Children love to play, and the purpose of play is to help in child development – nurture abilities, get them interested in the world and help explore their surroundings. Different types of toy help child development in different ways. During their first year, a child starts to become more coordinated and learns how to move their body. As they start to discover what their own body can do, these movements (also known as gross motor skills) start to become more complex and they need to use their bodies and movement, touching objects, moving things and playing with interactive toys during play. The type of educational toys that help with coordination and physical movement are toys which encourage stacking, building things, pulling, kicking balls and throwing items such as balls, hoops etc. As soon as they are born, children start to form relationships, and as they grow these relationships develop. An important area of child development is learning how to interact with other people, and there are interactive toys and games that help to build these relationship skills from an early age. The ability to form and strengthen relationships with people, make judgments (for example deciding between right and wrong) can all be developed and underlined if you involve your child in group games, role playing with children’s toys, team games, or playing with soft toys, puppets and musical toys and instruments. Children are born with an innate desire to learn, and educational toys use this to their best advantage by encouraging all aspects of learning. Some educational toys help with recognition, developing concepts, problem solving and consequences – the causes and effects of different actions for example. Child development starts at a very young age - a baby realises that if they touch their cot toys they move or make a sound, and they learn cause and effect – touch the toy there and it squeaks. Older children start to develop concepts and have their own ideas as they meet and interact with new people and get accustomed to different things about the world around them. Books, games, educational toys like construction toys, puzzles and interactive toys with lots of different shapes and sizes can really help to stimulate children’s mental activity in many ways. Even role playing with children's toys helps develop a child's imagination and creativity as well as communication skills. How Can I Choose the Best Toys for Child Development? Can the toy be used in more than one way? Does it have several purposes so that your child doesn’t get bored quickly? 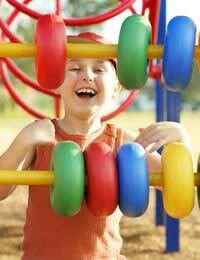 Can a child use their own imagination and ideas while playing with the toy? Is it fun, safe, and durable? Are there different levels of difficulty to correspond with your child’s ability? Is this toy something your child will enjoy playing with for a reasonably long time? There are no hard and fast rules about which toys will be best for child development – all children are different and you have to make a judgement call on what will keep your child happy, entertained and stimulated. The number of educational toys, role play toys, musical toys and interactive toys you can choose from are almost limitless, and with a bit of imagination and time, you can be sure to give your children a head start in ways that encourage learning while playing at the same time. my son can't use pedals, does anyone no of any sit and ride products, suitable for a 6 year old,he loves his cozy coupe car, but is nw to bigfor it!! I didn't find this very helpful at all and the link you give is for sweet food and cakes - not something I want to send my handicapped niece especially when I 'googled' toys for handicapped children!